I know I haven’t updated for the longest time. I know, and I’m sorry for that, I just never managed to find some free time to update this blog. Anyways, here you go, some news! Once I came back from the very first mapping session, I didn’t really hear anything. I felt strange sensations in weird spots in my brain and those sensations didn’t look like sound at all. I had (and still have) most of the sensations if there is paper which is crinkling, metal/other kitchenware clattering and when water is flowing. The second mapping session was a few days later, I got 4 programs on my processor again, with increasing sound levels. I had to be on program 4 when I would go to the next fitting. During the first 3 weeks, most of the sensations changed into something I started to perceive as sound. At the third mapping, 3 weeks after the second mapping, I got the SONNET EAS: they gave me a normal SONNET at first, but I insisted on getting the EAS as I really wanted to get the most out of my residual hearing. It isn’t an enormous difference, but it definitely feels more comfortable having some acoustic input. Some of my electrodes can’t be stimulated as much as I would like them to be stimulated, as I’m getting unwanted facial twitches if the electrodes are too loud. I’ve been to 7 aural therapy sessions already, and I’m pleasantly surprised with my cochlear implant. The sound quality of the implant is SO much better than with my hearing aids. All sounds are so much more clear and crispy. I’m really, really glad that I made the decision to get a cochlear implant. I can’t suddenly “hear” (didn’t expect to either), but it does make a big difference. Sounds are more crisp and clear. I’ll try to make a more elaborate post later, just letting my dear readers know that I’m still alive, kicking and very glad with my implant! I went to the 1-week post-surgery appointment last Wednesday. The surgeon took off the band-aid and removed the stitches from behind my ear. I could wash my hair that evening but was advised not to let any water enter my ear canal for at least another 2 weeks. The incision is very nicely done. I will post a picture of the incision area later, didn’t get the opportunity to take one yet. I got implanted with the FLEX28 electrode and the Synchrony pin system according to the surgeon. I also asked if I could get a copy of the CT scan home with me next time. I don’t have any side effects and I really feel amazing. No pain (just a little uncomfortable if I sleep on the implant side), no dizziness, nothing. My spit is still slightly blood-tinged if I draw back my nose though. The first fitting will happen on August 25th! Looking forward to it! 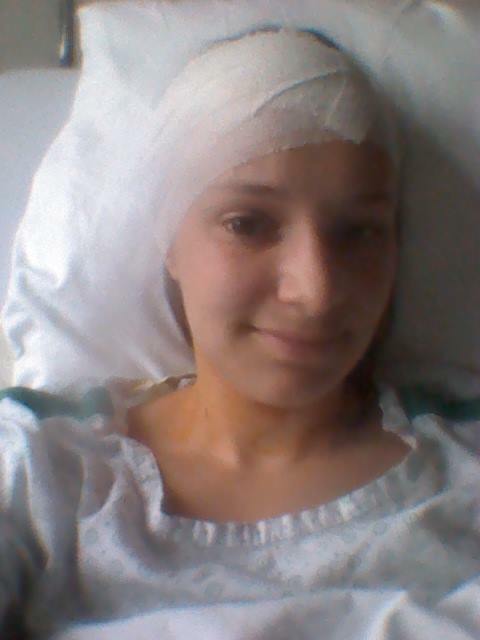 I had my surgery last Tuesday, the 14th of July. I had to be at the hospital at 8:30 in the morning, sober. I was put into a room with 2 other people, the 4th bed in that room remained empty. At 10:15 I went to the pre-surgery room for a last talk with the surgeon and at around 11:15 they gave me extra oxygen and then the intravenous meds knocked me out. At 2:45 PM, 3 and a half hours later, I woke up in the recovery room. I had a giant bandage around my head and was feeling very hungry, but I didn’t have any pain. One hour later, at 3:45, they rolled me back to my room and I had visitors for the rest of the day. I could walk just fine, feeling really good, I wasn’t dizzy, nauseaus or anything, just very annoyed by the bandages around my head as it felt like my ear was folded over and then taped to my head under these bandages. Yay, I got implanted! Look at these lovely bandages. Something I was really annoyed by, though, was the fact that I wasn’t allowed to eat anything after surgery. They explained that if you eat too quickly after surgery, you’ll throw up. At 7 o’clock in the evening, they finally brought me some food. I didn’t eat a lot since I was a bit scared to get nauseaus, but I was really happy that I got some food. One hour after eating, my stomach became slightly upset and it remained like that through the night. I was so glad I didn’t eat a lot despite being so hungry. That night in the hospital was horrible. I couldn’t sleep with the bandages at all, and every hour a nurse came in with a small spotlight, either to change my IV meds or to check up on the other 2 people in the room. I’m quite sensitive to changes in light while sleeping, so anytime a nurse entered I woke up. I woke up at around 5 AM (I didn’t sleep any more than 2 consecutive hours that night), hoping for the bandage to be taken off quickly. At around 8 o’clock they put me in a wheelchair and rolled me to the audiology department, where the surgeon told me the operation went smoothly. They took off the bandages and put a band aid over my scar. They also gave me an appointment for Wednesday the 22th for a check-up, where they’ll take off the band aid. After that, I got rolled back to my room and ate some breakfast. After finishing breakfast and becoming slightly nauseaus again, I had to walk to the CT department to have a CT scan taken of my head. After that I went back to my room all alone, almost getting lost in the hospital. Once I got back to my room, they ripped out the IV meds and told me I was free to go home. I ended up going back home at around 11 AM. I didn’t go straight home, since my grandmother wanted to take care of me for a few more days before allowing me to go home. I haven’t had any vertigo attacks, no taste disturbances, no tinnitus, globally I’m feeling really great. The nausea disappeared after the third day. I have never been in pain, haven’t taken any pain relievers since coming home either. My ear feels slightly full, and it’s still a bit weird to move around my head. My scalp has been itching a lot though, especially at the implanted side. Another fun thing is that if I’m yawning and then make some noise, I can actually hear some of the noise through the fluid-filled middle ear. Pretty cool. I’m still spitting up a bit of bloody discharge on the 6th day, but every day I’m noticing less blood, so I think it’s healing pretty nicely. Now, on to Tuesday. Once the band aid is gone, I’ll try to post a picture of the scar itself. Cochlear implants: speech and sign language in deaf children? There’s always a huge controversial debate going on about whether or not a deaf child should learn sign language, some people fearing that it might hinder speech development. There are just as many myths out of there as there are facts, and I don’t feel like summing up all of them. Rather, I would like to share my own, personal view on this subject. When talking about a child I’ll be using “his”, but this totally counts for the little girls too. I’m just too lazy to type “his/her” every time, and “it” feels just too impersonal. Each child and every parent is different. Some children have capabilities that other children don’t have, and everyone should strive to offer their child whatever works best in their situation. First and foremost, I think it’s important to offer the child a good foundation for a language. If you teach a language, be sure that you can master the language yourself. Immerse the child in language, the most important thing is that the child learns to have fun with languages. One thing to remember: Once the child takes off his or her processors, they’re deaf. I think it’s important to have backup communication abilities for these times. Myself, I can read lips very well since sound never really made sense to me anyways, so it was my only option. However, lip-reading isn’t easy, and it usually has to be done in less than ideal circumstances. I believe that a child which wears his processors almost non-stop will have a very hard time learning to speech read as it’s not really necessary to invest any time into it. To learn an auditory language, it IS necessary to spend extra time with the child, to train with the child and go to audiologist and speech therapy sessions often. It isn’t fun for the child if you keep on ‘testing’ whether the child hears or understand something, just for testing purposes, but if you make discovering sounds and language fun, it will only be beneficial for the child’s personal development. However, I think it’s important to have a backup plan, just in case. There will always be times where hearing is hard, if not impossible. It just feels better knowing that communication is possible at all times. If you don’t know sign language, or aren’t fluent in it, I wouldn’t recommend teaching it to the child as a first language before the child earned a good foundation for languages. But once the child is confident in one language, I think it’s enjoyable for the child if there’s a way to communicate when the child doesn’t have access to his ears. If you are motivated and willing to learn sign language, and you know you will be capable to provide him with adequate language input, please don’t keep yourself from signing. When done consistently, this will allow for earlier access to language, and… at some times it’s just fun to be able to break through the sound barrier together, as a family. I’m pretty sure that the child will also be thankful later that he gained the opportunity to learn another language. Some people expect their child to score just as well as his peers. Some people are sad or disappointed if the child doesn’t develop amazing spoken language right away, but I personally don’t think that this is a huge problem as long as the child is happy and can play along with friends without problems. I believe speech therapy can solve pretty much anything, if you just go on with it long enough. The most important thing here is that the child can hear, communicate, live and strive. Let him be an amazing, happy person, proud of who he is and what he has achieved despite, or even because of this amazing piece of technology. Merry Christmas, my dear readers! I’m thankful for any and all likes, comments and follows I have received so far, and the ones that are still to come. It makes me happy to know that there are people taking the time to read and enjoy my posts. Love you all. Third appointment, the waiting game has begun. So, I went to the hospital today for my last appointment. I spoke the intake doctor and the surgeon. The intake doctor asked me if I was sure and we talked a bit about the implant and the processor I wanted. Then the surgeon came in, and we talked about which side to implant, the length of the electrode (probably 28mm, he did some quick measurements on the CT scan), the risk of side effects like losing taste, the fact that residual hearing will probably be lost, and stuff like that. I signed some papers for the insurance, and went back home. Pick a processor: I picked a white SONNET, one with the acoustic part included. Pick the implant system: I’ll have the SYNCHRONY with the new fancy schmancy rotateable magnet that allows MRI scans. The surgeon said there are actually 2 separate, rotateable magnets in the case. Decided the ear that will be implanted: I decided I want my right ear to be implanted. This is the “better” ear of the two, I also read that the right ear usually has slightly better results if both ears have comparable hearing loss. The surgeon added that the left part of the brain (connected to the right ear) usually processes language and speech, while the right part (connected to the left ear) processes music better. I honestly don’t hear much of a difference between my ears, so right ear it’ll be. Signed the papers for the insurance: All the required documents have now been sent to the insurance, and it’ll take about three months before I can expect a reply. After I have received a reply, the surgeon will tell me the possible surgery dates. Maybe if I end up losing all residual hearing in my right ear due to the implantation, I could wear the SONNET with an earmold in my left ear with a longer cable, so I’d have the acoustic input in my left ear, and full electric stimulation in my right ear. Lol, I want to do crazy stuff. Can’t wait. Previous: Cochlear implants: Realistic expectations + what to expect? Next: Med-El speech processing strategies: FSP? FS4? FS4-p?